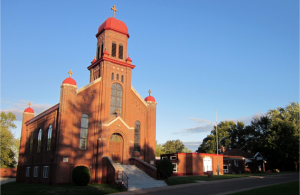 Built in the 1920’s, St. George was constructed by Serbian immigrants who came to northern Minnesota looking for work in the steel plants and iron mines in the area. The building itself has an architectural history to the area, but the essence of the church and is steeped in the long rich history of the Serbian culture and Orthodox faith. The Holy Liturgies and other services at St. George Serbian Orthodox Church are served in both Serbian and English. The liturgical choir sings responses and liturgical music in both English and Slovanic. Fr. Kristijan Petrovich is available for spiritual guidance, and to perform house blessings, baptisms, weddings, Slavas, last rites, funerals & memorial services. Those prepared for confession should pre-arrange to meet Fr Petrovich either prior to the start of the Holy Liturgy for confession, or following services; depending on available dates and times. Holy Liturgies are held every Sunday at 10AM. 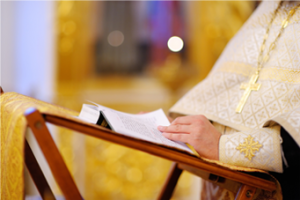 Additional services for Church Matins and Liturgical Holidays will be posted on St. George’s calendar. For more information regarding church services at St. George or for individual spiritual guidance, please contact Fr. Kristijan Petrovich directly. St. George Serbian Orthodox Church not only commemorates St. George, but also the Patron Saint of the Serbian people and the first Archbishop of the Serbs, Saint Sava. Saint Sava is canonized and venerated by the Serbian Orthodox Church, as its founder, on January 27th each year. But, the tradition of celebrating saints is not unique to the Church itself. The commemoration of Krsna Slava is one of the most important expressions of the Serbian Orthodox faith. Serbian ancestors celebrated their Krsna Slava, regardless of how dangerous the situation and ensuring the candle of their Patron Saint was never extinguished. The celebration of the Patron Saint in the church carries on today as a way to link the past with the present. The Serbian Orthodox church celebrates all Saints of the Church, and comes together as family and community to honor each Serbian Orthodox family’s individual Patron Saint.